The DP120 range combines a substantial maximum volume and gross weight (3500kg) with the option of a removable container. When the container is removed, the DP120 can be used as a conventional flatbed trailer. Body lengths of 10', 12' and 14' are availabe, all with standard headroom of 6'. A tri-axle is an option on the 12' model and standard on the 14' version. 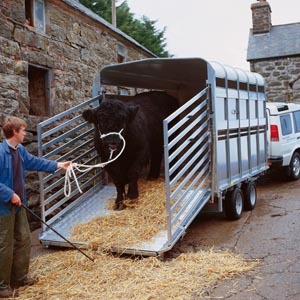 All sizes are available with either the standard ramp or with the EasyLoad™ ramp and folding deck system.